A third appearance on this year’s ITTF World Junior Circuit, a second round departure one year ago; on Thursday 9th March, it was first place for Austria’s Maciej Kolodziejczyk. Focused, the 16 year old captured the Junior Boys’ Singles title at the 2017 Italian Junior and Cadet Open in Lignano, to record what could very well prove to be a watershed victory in his career. 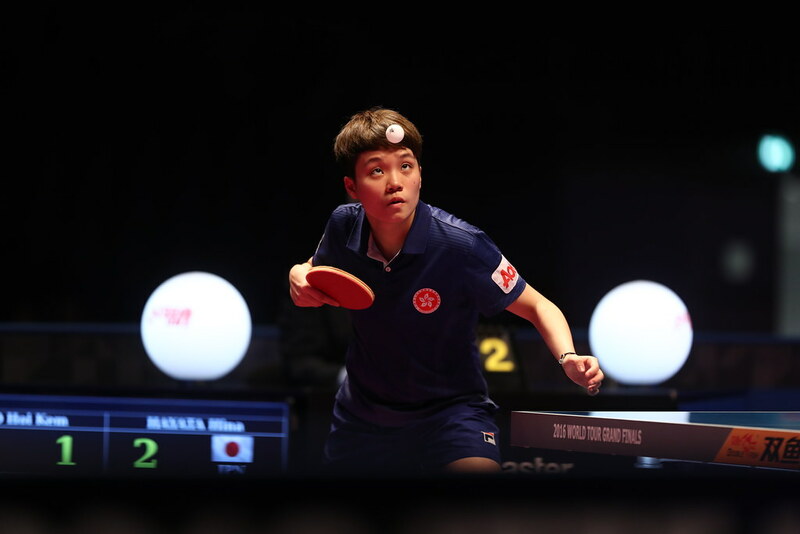 Never previously had he progressed beyond the third round of an ITTF World Junior Circuit Boys’ Singles event, arguably his best performance being earlier this year in the Czech Republic when beaten in round three by Germany’s Tobias Hippler. In Lignano there was no revenge win against Tobias Hippler but it was Maciej Kolodziejczyk who had the last laugh. The top seed, Tobias Hippler experienced a surprise quarter-final defeat at the hands of the host nation’s Antonino Amato, the no.8 seed (5-11, 11-8, 11-7, 11-8, 11-9). Impressively, Antonino Amato continued his good form to beat colleague, John Oyebode, a player who had been required to compete in the qualification stage (12-10, 6-11, 11-9, 11-5, 11-4), to reserve his place in the final where Maciej Kolodziejczyk awaited. Similar to Antonino Amato, Maciej Kolodziejczyk had exceeded expectations to reach the title decider; opportunities arose, against in-form players those opportunities were seized. Day Two at the 2017 Italian Junior and Cadet Open in LignanoThe no.9 seed, in the round of the last eight, he overcame Germany’s Kay Stumper, the no. 14 seed (11-6, 12-10, 11-8, 11-9), before ending the adventures of Spanish qualifier Francisco Miguel Ruiz (11-7, 10-12, 11-8, 10-12, 11-9, 12-10). Notably in the third round, Kay Stumper had beaten Hungary’s Istvan Molnar, the no.2 seed (4-11, 11-8, 11-7, 8-11, 11-9, 17-15), Francisco Miguel Ruiz had ended the hopes of the host nation’s Matteo Mutti, the no.3 seed (5-11, 11-7, 7-11, 11-6, 11-9, 11-9). Disappointment for Matteo Mutti, the country’s leading junior but in the final, it appeared that the top step of the podium was destined for Italy; Antonino Amato secured a three games to one lead, before Maciej Kolodziejczyk recovered to clinch victory in seven games (6-11, 8-11, 12-10, 12-14, 11-8, 11-6, 11-4). Gold for Maciej Kolodziejczyk, silver for Antonino Amato; earlier in the day in the Junior Boys’ Doubles event it had been the reverse scenario. Antonino Amato alongside colleague, Daniele Pinto, the no.3 seeds, accounted for Maciej Kolodziejczyk and Thailand’s Yanapong Panagitgun, the no.4 seeds, at the final hurdle to arrest the title (8-11, 11-9, 9-11, 11-9, 11-3). Earlier in the day at the quarter-final stage, Antonino Amato and Daniele Pinto had beaten Hungary’s Patrik Juhasz and Istvan Molnar, the no.5 seeds (11-9, 11-9, 7-11, 11-4), before ousting Tobias Hippler and Kay Stumper, the top seeds (11-4, 10-12, 11-9, 11-1). Meanwhile, in the opposite half of the draw, in the latter stages, Maciej Kolodziejczyk and Yanapong Panagitgun had defeated the Slovak Republic’s Stefan Peko and Tibor Spanik, the no.8 seeds (11-7, 11-7, 11-5), before ending the hopes of Germany’s Cedric Meissner and Meng Fanbo, the no.6 seeds (11-7, 11-7, 4-11, 11-8). The individual events completed, attention now turns to the Junior Boys’ and Cadet Boys’ Team competitions.